This chapter introduces three subsidence analysis models which are total subsidence, tectonic subsidence and post-rift thermal subsidence. 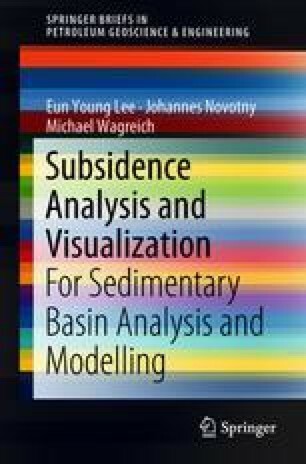 The three subsidence models are essential to understand evolution of a sedimentary basin. Due to compaction effect, the present stratigraphic framework of a sedimentary basin fill does not present directly the primary thickness of each sedimentary layer and changing total depth over time. Therefore restoring thicknesses of the compacted layers using appropriate compaction trend (decompaction) is a crucial step to start subsidence analysis, and the total amount of the restored thicknesses through time results in the total subsidence. Tectonic subsidence analysis (backstripping) removes sediment load and paleo-environmental effects from total subsidence depth to reveal the amount of subsidence induced by the tectonic driving force. The tectonic subsidence curves can be an indicator to recognize the basin type, because basins in similar tectonic setting show similar patterns and shapes of tectonic subsidence. Many basins experience the post-rift thermal subsidence caused by relaxation of lithospheric isotherms to their pre-stretching position. The thermal subsidence is evaluated generally by applying appropriate stretching factors (β) to tectonic subsidence curve observed from the post-rift phase.